If there is still debris in the road rash, sterilize tweezers with alcohol and use them to get the stones, glass, dirt, and other elements out of the cuts. Cleaning the area with a gentle soap and a washcloth can be helpful. Once all debris is removed and the area has been cleaned and patted dry, it’s best to apply an antibiotic ointment to help prevent an infection and keep a scab from hardening and cracking. Of course, treating a road rash injury is always best left to medical professionals. 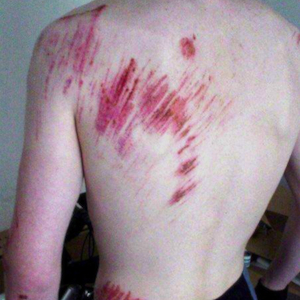 It is best to cover the road rash with a loose, non-stick bandage. This could be a band-aid, gauze with tape, or large dressing. Changing this dressing frequently is important in order to keep the area clean and the bandage from sticking to the wound. This covering will keep the scrapes from sticking to your clothes. Once the wound has stopped oozing a dressing is no longer necessary. This can happen anywhere from a week to two weeks after the crash. In order to decrease the likelihood of scarring from moderate road rash the wound should be kept clean, covered in antibiotic ointment, and bandaged. In order to avoid road rash, it is important to be properly equipped and attired when riding a motorcycle. Although it is not the law in New Hampshire, wearing a helmet is highly encouraged when on a motorcycle. Riders should also wear appropriate foot gear and not flip flops. Over the rest of the body it’s best to wear full protective gear including pants, a jacket, and gloves. The NH Motorcycle Lawyers of Tenn And Tenn, P.A. are experienced riders and seasoned Personal Injury Attorneys. We understand that no matter the extent of your road rash injury, injured bikers are entitled to full compensation under the law for their injuries. The Motorcycle Lawyers at Tenn And Tenn, P.A. offer free case evaluations during which you can learn more about our legal team, your personal injury claim and how our New Hampshire motorcycle lawyers can be of assistance. Contact us today at 1-603-624-0028.